A recent report published by Infinium Global Research on industrial laser market provides in depth analysis of segments and sub-segments in global as well as regional markets of industrial laser market. The study also highlights the impact of drivers, restraints and macro indicators on the global and regional markets of industrial laser over the short term as well as long term. The report is a comprehensive presentation of trends, forecast and dollar values of global industrial laser market. According to report the global industrial laser market is projected to grow at a CAGR of 5.5% over the forecast period of 2018 - 2024. Increase in need for product marking to offer better traceability is expected to be the factor driving the growth of the market. Additionally, the growing need for heat treatment, welding and drilling are driving the demand for industrial laser market. However, difficulties in cutting the reflective metals such as aluminum and copper is a primary factor restraining the growth of the market. Moreover, the advantages of laser cutting technology over the traditional methods of cutting are anticipated to boost opportunities for the key players in the global industrial laser market over the upcoming years. The report on global industrial laser market covers segments such as product type, power type, end-use and application. The product type segments include fiber lasers, Co2 lasers, solid state lasers and others. On the basis of power type the global industrial laser market is categorized into high power, medium power and low power. Furthermore, on the basis of end-use the industrial laser market is segmented as medical, defense, oil & gas, manufacturing, construction, automotive, electronics and other. On the basis of application the industrial laser market is segmented as marking, micrometrials and macromaterials. The report provides profiles of the companies in the global industrial laser market such as, Han's Laser Technology, Calmar Laser Inc, IPG Photonics, Clark MXR, Coherent, TRUMPF, Apollo Instruments, 3 SP Technologies S.A.S, Hypertharm Inc, and Amonics Ltd. The report provides deep insights on demand forecasts, market trends and micro and macro indicators. 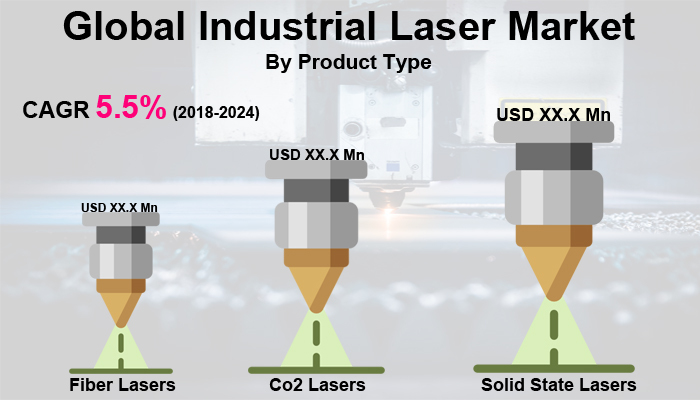 In addition, this report provides insights on the factors that are driving and restraining the global industrial laser market. Moreover, IGR-Growth Matrix analysis given in the report brings an insight on the investment areas that existing or new market players can consider. The report provides insights into the market using analytical tools such as Porter’s five forces analysis and DRO analysis of industrial laser market. Moreover, the study highlights current market trends and provides forecast from 2018 to 2024. We also have highlighted future trends in the industrial laser market that will impact the demand during the forecast period. Moreover, the competitive analysis given in each regional market brings an insight on the market share of the leading players. Additionally, the analysis highlights rise and fall in the market shares of the key players in the market. This report will help manufacturers, suppliers and distributors of the industrial laser market to understand the present and future trends in this market and formulate their strategies accordingly.